The mini machine helps researchers in far flung locations from Sierra Leone to outer space. For decades, scientists hoping to unravel the riddles of DNA were tethered to expensive, cumbersome equipment. Typically, the analytical tools used in biotech or crime labs cost anywhere from $3,000 to $10,000. But two local scientists have created a small, portable device that allows researchers to conduct studies at a fraction of the cost, using a smartphone or tablet to monitor the process. 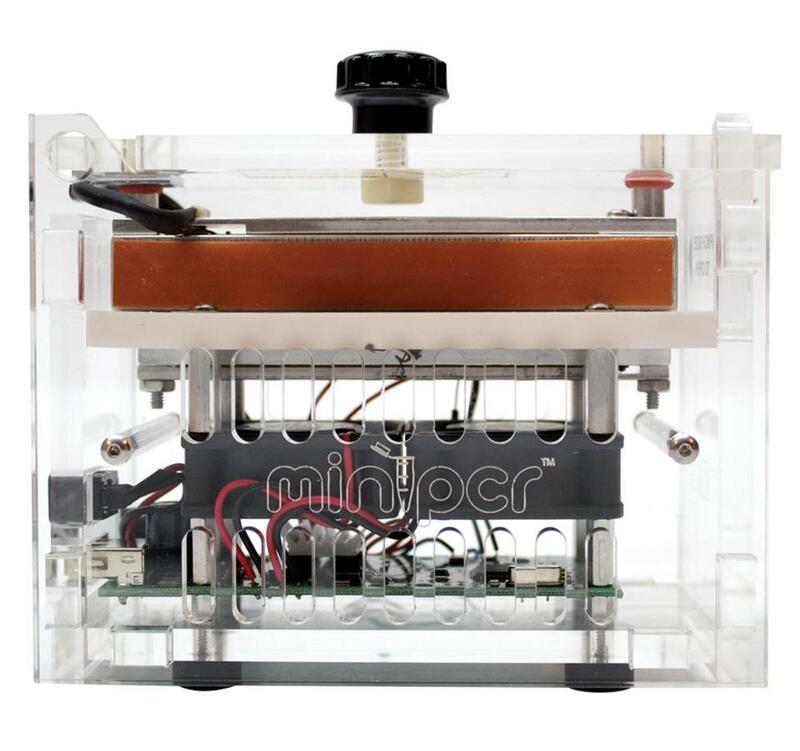 The miniPCR machine, developed by biologists Sebastian Kraves and Ezequiel “Zeke” Alvarez-Saavedra, was launched as a Kickstarter project in 2014. After raising more than $66,000, the Harvard- and MIT-educated duo quit their jobs to launch their Cambridge-based company, Amplyus. Its $990 DNA Discovery System uses the miniPCR and visualization technology to replicate targeted pieces of DNA, quickly creating up to a billion copies — the quantity necessary for molecular and genetic analyses. MiniPCR equipment is now in the hands of thousands of scientists (and citizen-scientists) in hundreds of schools and dozens of remote locations. Researchers have carried devices to a lemur colony in the rain forests of Madagascar, to Ebola clinics in Sierra Leone, and to farms in Southeast Asia, where they’re using the kits to help contain viral outbreaks. This week, a miniPCR is scheduled to be sent into space. “We wanted to make DNA technology simpler so that everyone could access it,” says Kraves, who has been astounded by the applications users have found for miniPCR technology, from far-flung research expeditions to more domestic endeavors (people have used it to test their food for GMOs, check the kind of blood a tick had been ingesting, and genotype the yeast from home brewing projects). “Our passion is in educating and enabling science in new places,” Kraves says. The space mission had its beginnings when Boeing and the Center for the Advancement of Science in Space visited the Amplyus team in residence at MassChallenge, the Boston startup accelerator. The center manages some of the research done on the International Space Station. “They took an interest in our technology to do DNA analysis never before attempted in space,” Alvarez-Saavedra says. One result was Genes in Space, a competition that invited student ideas for a DNA experiment using miniPCR technology to be conducted on the space station. The first winner, Anna-Sophia Boguraev, a teenager from Bedford, New York, came up with a study to examine how weightlessness and cosmic radiation affect astronauts’ immune systems. Her experiment will be onboard a SpaceX shuttle set to launch on April 8. Definition: PCR stands for polymerase chain reaction, the process by which a piece of DNA is rapidly copied in large quantities before being analyzed. Janelle Nanos is a Globe business reporter. Send comments to magazine@globe.com.